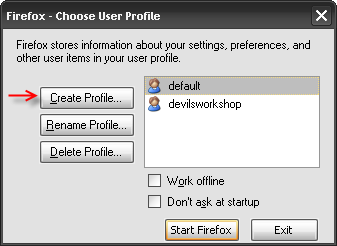 WhatSreeKnow: How to Create a New profile in Firefox ? How to Create a New profile in Firefox ? Important: Before you can start the Profile Manager, Firefox must be completely closed. Exit Firefox. To close Firefox, at the top of the Firefox window, select the File menu, and then select Exit. Now, right click on the shortcut in desktop and select properties. Add -p in the target as shown in screenshot above. Open the shortcut to see a window as shown in screen shot above.This is an option to make a new profile. Just choose Create profile option and follow the instructions to create one. That is all, Now you need to install Grease monkey again and it’ll work as good as ever. Sree®©. Picture Window theme. Powered by Blogger.